I’ve put together a quick video which steps you though the basic checks you can do to make sure your braking system is in good order. 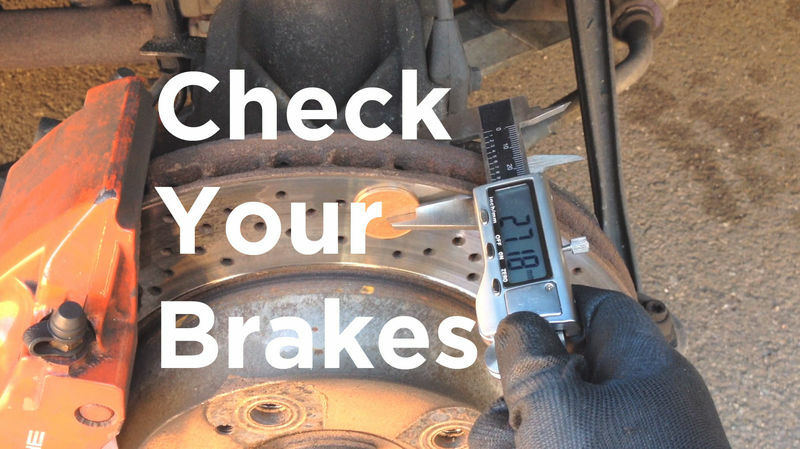 If you want to quickly check the brake pads you can do so by looking through the wheel. You want to check the pad thickness as indicated in the video. You won’t be able to see both pads but it’s better than nothing. To fully inspect the brakes the wheels need to be off. Check out my other video here if you want to learn how to safely lift your car and remove the wheels. So let’s check the wear levels of the pads and discs. Your handbook or manual will tell you the minimum thickness of each. For my Boxster the pads are 12 millimetres thick when new and should be replaced when down to 2.5 mil. Most cars have brake wear sensors but it’s always best to manually check once in a while as they are not always perfect. Next we will check how worn the brake discs are. Take a micrometer and measure the thickness of the disc. The disc will probably have a lip around the top edge so to get an accurate reading place two coins on each side of the disc and measure here. Write down the reading then measure the two coins and write this reading down. Take the coin size away from the first reading to get your disc thickness. For my Boxster discs are 28 mil at the front and 24 at the rear. The minimum thickness is 26 mil front and 22 rear. If you have drilled discs like the ones shown check for any cracks developing from the holes. If you see cracks longer than 7 mil on yours then they need replacing. The brake lines and hoses carry the brake fluid so you want to check that they are free from cracks, wear and leaks. Rubber perishes over time so if your hoses are over 10 years old it’s worth considering replacing them. Inspect the callipers for signs of rust and leaks, especially from the bleed valves. At this stage you have the option to inspect the pistons and boots but you’ll need to take the brake pads out first. My other video here shows you how. Now you can put the wheel back on and repeat the process on the other 3 corners. Next we will inspect the master cylinder, brake fluid and booster. Your manual will tell you where yours are but in my Boxster they are hidden behind a piece of plastic in the front boot (or bonnet for my American friends) which is kept in place with one screw and one bolt. The brake fluid reservoir holds the brake fluid. The brake master cylinder is responsible for pushing brake fluid into the callipers when you press the brake pedal. The brake booster increases the braking effort of the master cylinder meaning it’s less tiring for the driver to depress the brake pedal. You want to check for damage, rust and any leaks especially from where the brake lines connect. The brake fluid should be clear like shown and not dirty. Brake fluid should be changed at least every 2 years and this video here show you how. To test the master cylinder get in your car and start the engine. Press and hold the brake pedal down. If the pedal gradually goes all the way down to the floor the master cylinder is faulty. Just before you turn off the engine, push down on the brake pedal and hold it. Turn the engine off, and then continue holding your foot on the pedal for another 30 seconds. If the pedal stays where it is, then the brake booster is fine. If the pedal starts to move then it is time to replace it. Last edited by neil_b; 03-29-2016 at 10:00 AM. Your American friends call the front boot the front trunk ... or frunk. Bonnet never happens here. Are you sure about 26/22 as minimum? Pelican parts states: 26/22 for 987 but 22,6/18,6 for the 986? But they also seems to mix up S and non-S. I'm confused, whats the minimum for my 2003 S? 2003 S front rotors new 28mm replace at 26mm, rear new 24mm replace at 22mm, basically when you get a 1 mm lip.